And here is our dining room, which seats ten in a pinch. Fab for company and holiday dinners and Sunday quilting afternoons and doing puzzles and sorting papers... But, we rattle around in there a bit, and as much as I love our Stickley-esque furniture, the chairs are too big to be really comfortable for short me. So kitchen it is. What about you, REDS? Do you and your spouses sit down together for meals, and eschew media temptations? HALLIE EPHRON: We do sit down at 6:30 every night for a home-cooked meal (or leftovers or pizza or Chinese...) but always sit down, no media, no tablet, no phone, no reading matter. Usually wine. We don't have room for a table in our kitchen so we sit in the dining room and I only have one set of dishes so we eat off the good-enough ones that I got when we got married a loooooong time ago. I believe in a real family dinner. In my family, we always had a sit-down dinner and my parents expected us to TALK (in my family it was a competition) -- as dysfunctional as my parents were, it was the one thing they did right. I've always made dinner when my kids were little -- my quiet 20 minutes in the kitchen after getting home from work, a glass of wine and an onion to chop and I could be civilized -- and we sat down as a family and *talked*. It teaches kids about table manners and how to have a conversation. As I'm writing this I'm preparing a chicken roasted in the barbecue over coals and a couscous salad for a late dinner with my daughter and her husband after their two little ones are down for the night. RHYS BOWEN: When my kids were at home we always ate dinner that I had cooked. Sometimes their friends joined us. 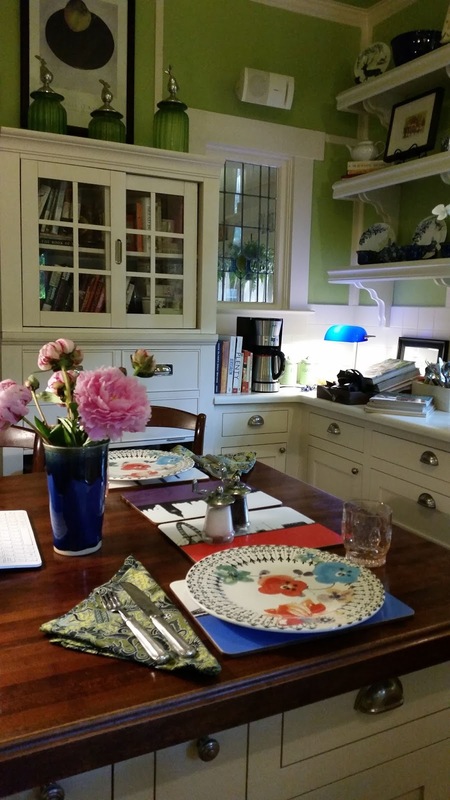 These days John and I eat at the table in the kitchen, unless we have guests or family over. One of us cooks, from scratch. Never a pre-packaged meal in our house! Tonight it's pork tenderloin in a garlic mustard sauce. Sometimes we have the TV on, and watch Jeopardy, and sometimes we talk. But we've never owned TV trays and never had a TV in the kitchen or dining room when the kids were small. I love noisy family dinners! 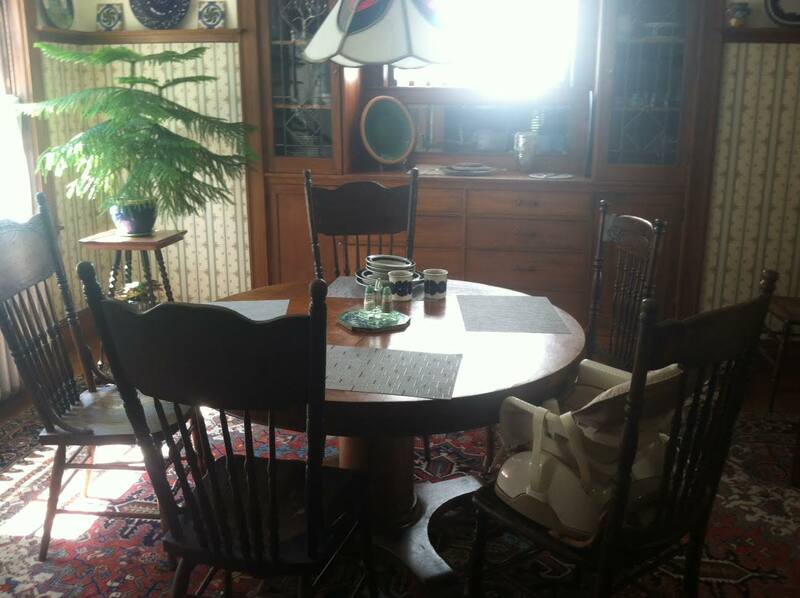 LUCY BURDETTE: This photo is from 1963, our kitchen table from my growing up days. We always always had dinner together, with a German Shepherd or two under the table to accept scraps. When I was single, I usually ate in bed LOL. But once I married John and married into his little kids, we went back to the kitchen table. Dinner at six, and conversation, though I very much doubt we could have kept up with the Ephrons! John and I still eat together at six, say grace, and talk about our days. I hope we never give that time up! HANK PHILLIPPI RYAN: Oh, we are outliers. We have dinner at--forgive me, about 9. We always have dinner together, it's really a ritual, and although usually we talk, sometimes we watch a movie or something wonderful on TV. I'd say I cook three days a week. (Tonight we are having rack of lamb grilled outside, and green beans, with coconut shrimp appetizers.Yesterday we had cooked out hamburgers and salad.) Other nights we go out, or carry out. Thursdays it's Jonathan's responsibility. I say--don't even ask what I want. Just provide it. It's usually pizza. wonderful. We eat at the family room table, since the dining room table is covered with book research and administrative stuff. Thats why Im always delighted to have dinner guests, because it forces me to clean it up. When I was growing up, five kids, we always had dinner together, at a big round table in the dining room. And yes, we HAD to talk, and tell stories, and tell one thing that happened to us during the day. We'd also fight over who got to turn the Lazy Susan in the center. 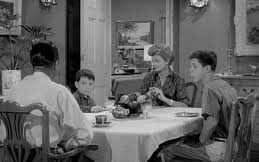 DEBS: Hank, we eat late, too. Dinner before eight at our house is a shock! We had regular sit-down meals with the kids right up until The Boy began high school. He vastly preferred doing his homework on the kitchen table instead of in his room, and so unless we used the dining room table (which is very large and, like Hank's, usually covered with papers, etc.) we were stuck with working around a spread of textbooks, scientific calculators and notebooks at dinnertime. In addition, we now had TWO kids in two different high school doing cross country/track/track and field, as well as being involved in drama, music, etc. We still made homemade meals, but making the dinner itself eat-as-you-go became a lot more workable than getting everyone to sit down. Things have obviously calmed down a lot since then, so we try to have a sit-down meal in the dining room about once a week. And of course, we have very formal seatings at our big holiday parties: six pieces of silver at each plate, bread dishes, soup bowls and plates and water and wine glasses. And Debs, we always use cloth napkins - they really are cheaper in the long run! DEBS: Oh, so fun! I love it that everyone eats together. And I'm impressed that we all (mostly) cook. And I love everyone's kitchen/dining rooms! READERS, what about you? Do you sit down with spouse/partner/family for nightly dinners? And if you live alone, do you make dinner special? Sometimes we eat out but mostly I cook and we eat together at the dining room table that’s set with nice place mats and cloth napkins tucked into napkin rings. We use either the “good” dishes, the special dishes that my daughter bought one Christmas, the “regular” dishes, or the divided plates my husband refers to as our Romulan dishes. We actually have lovely wooden tray tables, but they come out when the grandbabies are visiting and have a special breakfast in bed morning. l don’t think we’ve ever used them for eating dinner in the living room . . . . I love meals at the table and do my best to see that it happens occasionally. It was the norm for us until the youngest two (twins) made their move to independence. Selfishly, I hoped that they would find their separate ways with time between. After they were thoroughly launched, I think it was too easy to let opportunities like supper together pass. It's difficult to bring it back. Something I hadn't foreseen was how much the lack of a separate dining room in our new house would work against spending mealtime together, talking. I won't make that mistake again! For now I am looking for incentives to draw the action to the table. If there's a game on TV, right now it's the college world series, forget the table. Make snacky suppers. Debs, your kitchen table looks like the one my mother made for her kitchen. It is so similar it startled me to see it. I can't tell how long it is, but hers was about the length of your dining room table. Always home-cooked meals, always sit down together. We did that growing up - four kids - around the kitchen table usually at 5:30, and also when my two sons were growing up, both pre- and post-divorce. We hold hands and have a moment of silent grace before we eat. Hugh and I always sit down together to eat, too, like the rest of you, sans TV or radio, unless we're having a movie dinner like Debs - although that's less often in the summer because SOMEONE likes to watch baseball instead. I love eating outside on the deck during these months of the year. We have a dining room/kitchen great room (which comes with a fireplace so it is delicious in the winter) and we have a sit down dinner every night. We share the cooking too. Grilling is Gary's forte, in house cooking mine. I confess, we do have our cell phones on the table and often check in on the news. That can lead to some very heated conversations in our house, and some funny ones. I grew up with dinner on the table at 5PM - my father wanted it the moment he walked in the door from work. Can't imagine not needed downtime in between, but hey, everyone's different. And we were required to make conversation. The daily report from each of us was followed by someone telling a news of the day story and then we either discussed plans for a weekend, vacation, etc. or my parents would pick a topic for discussion and you contributed or you did the dishes! If it were up to me, I wouldn't have a big meal Ain the evening, but at lunch. However, Steve grew up with dinner on the table at 6:30, and by golly, that's when we eat. He doesn't work far away, and our nightly glass of wine is a nice segue from business for him. He pours while I cook, usually, and we discuss our days. We've always had a family meal, at the table, with cloth napkins and proper plates, etc. I cook about five nights a week, although I'm very good at disguising yesterday's meal as something "new" for tonight. Steve doesn't really care as long as he gets a meal. We were both single for a long time before we got married, and were both used to reading through dinner. We talk for awhile, but then often (not always) turn to one of the many books or magazines we're reading at the moment. This is why our kids learned to read so early, out of self-defense. As usual, I'm out in left field. Husband and I eat supper at around 5 PM on TV tables in the living room while watching the local news. Definitely home cooked, though. I think family dinners around a table are just fine, but since it has only ever been just the two of us, we never got in the habit. Our dining table seats four and we occasionally use it if we have company, but most of the time my jigsaw-puzzle table sits on top of it. I grew up at a FRAUGHT dinner table -- six o'clock on the dot "or else," and a half-drunk father ready to pounce on somebody. But we did all sit down to a home-cooked meal. 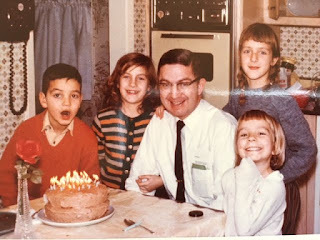 And I kept up that tradition with my own kids, although I am thankful that our dinners were calmer, and alcohol-free. My husband and I eat together at the dining room table, and sometimes that is our only time together in the day. I generally cook, but we do get Chinese once in a while. This winter and spring, one of the things I have been doing for my daughter and her family (Baby Girl #3 arrived in March) is go to her house, tidy the kitchen, make dinner and serve it in the dining room, clean up and then hold the baby through big girl bedtime. I think someone could make a business of doing that!! It feels like important glue in family life. Although we've been celebrating all weekend, Julie and I are celebrating our 20th anniversary today. One of these days we'll get married. And for twenty years we've had dinner together, always cloth napkins. The only paper ones in the house are the cutesy cocktail ones featuring a drunken nun. We have eaten most meals outside or in the living room this summer. The kitchen is under construction, and the dining room table is full of kitchen stuff as is every available surface in there. Deb, my new kitchen is looking a lot like yours, glass doors on some of the white cabinets, a great island taking shape in the middle. It will be covered with a gorgeous maple butcher block, the only thing saved from the old kitchen. I can't wait to have our dinners in there! No TV in the kitchen, but I must admit to watching reruns of The Big Bang Theory in the living room while we eat. When my children were growing up, we had dinner together every single night, cooked by me. It was a fun time to be together and also to hone manners. Therefore, we could four little ones out to eat publicly or to a friend's home knowing they all knew how to use a knife and fork. Years later I was at a restaurant with the first two grandchildren when they were one and three. It was chaos. My daughter turned to me saying, "We'd never have got away with this, would we have." Bingo baby Not in this lifetime. I grew up with a family dinner hour at the kitchen table and when our boys were home we had family meals in the kitchen. 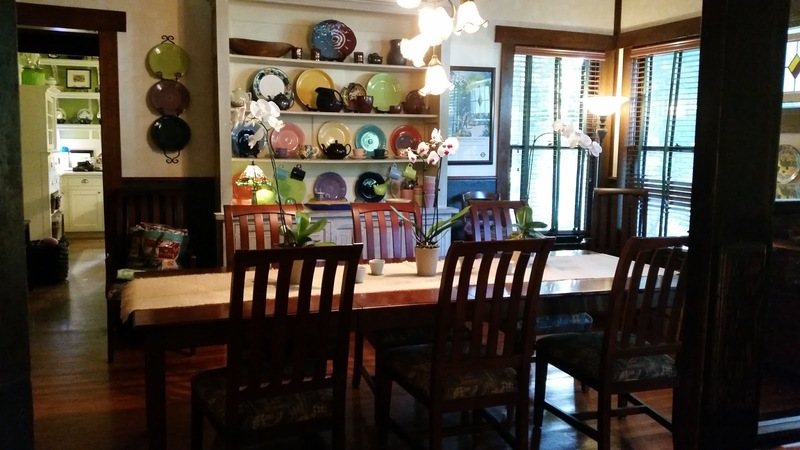 We used the dining room for holidays or when we had guests and could not fit at the kitchen table. Similar rules, no technical media. Now that the boys are out on their own, my husband and I still sit for meals and ban electronics from the dinner table. Funny, we do the Chinese take out on the coffee table and watch a show too. Growing up, we always ate at the kitchen table, talking about our day and such. I missed those days, but now the family is scattered across the U.S. I eat all my meals at my kitchen table, prepared at home except on the weekend, where I will have takeout, mostly Chinese or Italian. Because it's just me and I hate doing the dishes, I eat on paper plates. For those special days, where I really cook a meal, I'll eat on my good plate. Congratulations, Ann! And thumbs-up on the cloth napkins. We use them, too. Just because I hate to create unnecessary garbage... and of course it's nice. Wondering if one of the things my kids will say they missed growing up was a kitchen table. Family dinners in the dining room growing up, or at the kitchen table in later years when it was just my parents and one or two visiting kids/grandkids. With the boys, we always sat down to dinner together at the table in my eat-in kitchen. It wasn't always home-cooked, but it was always at the table, with the table set. And I never worried about taking them out to eat--they were always too busy eating, chattering to each other and to me, and observing to be any trouble. More often than not, strangers would stop by our table/booth, etc., to compliment the boys on their behavior. This summer, home-cooked meals together are a rarity with our work schedules--and I miss those times. We were very diligent about family meals at the table together as we were raising my son, and for the four years we had an additional young man living with us. Emptying our nest was a gradual and long process, but for the past year it has finally been well-and-truly empty, and we are still working on finding a new routine that works for us. I'd say we average eating out two or three times a week now, occasionally more. And my work and his volunteer activities tend to prevent us from both being home for dinner together another night or two a week. But for the three to four remaining nights, if we CAN be there together we are, and we cook real, from-scratch food, usually eaten at the kitchen table, without any electronics. Time can vary widely, though -- anywhere from 6 p.m. to about 7:30, depending on a whole list of variables. So fun to read everyone's comments! Ann, our kitchen island is cherry. 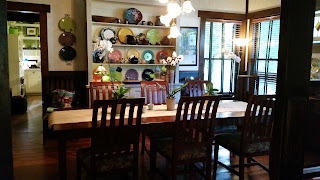 We redid our kitchen nine years ago--can't believe it's been that long--and still absolutely love it. I'm so glad to know that family dinners and dinner table conversation aren't dead. Good for adults, but especially good for children. Our daughter grew up eating with the grownups, and we were always able to take her anywhere. Hallie, we didn't have kitchen table when I was growing up--so all is not lost. Kim, what a terrific idea. I'd love to listen to music at dinner. No turntable in the kitchen, but I think you can see in the pic I posted that we have Bose speakers, and the sound system is in that cabinet to the left of the coffee maker. We just get busy, and I'm usually thinking when I'm cooking (book-thinking, you all know what I mean) so that would be a lovely break. XO to you, too! Ann, I meant to say, I think our cherry butcher block island came from a company in NY. We eat very early - maybe 5:00 PM. In the kitchen. We have a large dining room table we use frequently for family dinners - though we usually have to papers and computers off the surface. Generally home cooked dinners unless our schedules are a little wild - then perhaps a roasted chicken from the bistro or the supermarket with a salad and various veggies from here. Tonight, salmon, salad, corn, asparagus. I am a news junkie - so the odd (wo)man out here. Usually have the news on in the background but on mute with captions - then I'll flip it on if something current and interesting shows up. Somehow, we still have conversations. I have no defense - I know TV at dinner is frowned on and we certsinly didn't do when our children were home, but we're old now and can do what we want. What can I say? We've been married fifty years and still talk. I am happy to see how many of us eat real food at our own tables. Very heartening. My partner and I eat supper together every night; so many friends find this amazing and, possibly, odd. But for us, it's the only way to reconnect after a day at our separate work. Good food, good talk, good times. Ann: My partner, Val, and I married to mark our 20th anniversary. The impetus was a recurrence of the cancer that had first shown up about 17 years earlier. Our wedding was very small, at home, and so joyful -- I hadn't realized how happy a person could feel at such a ceremony. I highly recommend it. And, we'll mark our 23rd anniversary this coming August. Brava! This year is the kitchen reno. Enough excitement and we want to see if the relationship survives. Growing up, we ate dinner in the kitchen every day. Always cooked, not frozen dinners, although with four kids the quality of that cooking is debatable. =) We working around kid activities and the like. Going out, or ordering pizza was a treat! Even the years when my mother, a nurse, worked the 3-11 shift, the other five of us had dinner. No TV, no distractions. We kids had to talk and be civil to each other (if you couldn't be civil, you didn't talk). After dinner, my dad and I would pop in the soundtrack to "Top Gun" and see if we could get all the cleanup done by the end of the third track. That soundtrack still brings back memories. Now we don't have an eat-in kitchen so we eat in the dining room. Off real plates (but not cloth napkins - I can't keep up with the laundry as it is). We say grace, the kids have to tell us about their day, and we are militant about good manners. "Get your elbows off the table" is a frequent refrain. We do this as many times as possible a week, and I'd say we average around five times a week, maybe less depending on school/sports activities (swim season is rough). Usually home cooked. They are old enough that sometimes THEY cook! Again, ordering out is rare, and going out is even more rare. I have no idea if my kids will look back on this event with fondness or resignation. Fondness, I hope. When I have company we eat at the table in the living/ dining area; NO TV(well, I don't have one!) Otherwise, I either read or watch a DVD while eating dinner. I cook real meals about once a week and eat the leftovers the rest of the time. A few years ago I stopped using the Every Day dishes and started using the Good dishes all the time. They are much cheerier and I like them! I don't care if I'm the only one who will see them. Mine is the usual history here, growing up in the Fifties, the four of us at the dining table, having mom-cooked meals every night, usually about 6:00, sometimes 6:30. No television, but at that time there wasn't much on until 7:00 or after anyway. Table manners were emphasized, so was conversation, though the adults did most of it, my brother and I answered questions such as "How was swim workout?". Now? We're both retired, kids far away, just the two of us. Barbara is a news junkie, so the news comes on at 5:00 and runs to 7:00 (local and national on NBC, then same on CBS). She eats on the coffee table. I can hear it if I choose, though I usually tune it out, as I'm eating at the kitchen island and reading. We have home cooked meals (we alternate) 5 nights a week, including leftovers, and take out or pickup the other two. Restaurant meals are rare. Our dining room table, which seats 8 without the leaf, is used for guests, otherwise it sits empty except for a table runner and a pretty ceramic bowl or dried flower arrangement in a vase (cats will knock fresh flowers over and flood the table). If this sounds sad, that we go our own way at dinnertime, we both had a long time of family sit down meals and now are comfortable with a relaxed go-our-own-way routine. We're home together most of the time, reading, gardening, doing chores, on the computers, or what have you, there's not a lot of catching up on the day, we know that as it goes. So a must eat at X time in X place seems more artificial than needed. My husband and I eat our main meal together at the table in our dining area. Usually in the evening, although sometimes at midday. I cook, more often in the winter - we do a lot more carry in in the summer heat, and when I do cook I usually make enough for several meals. The time varies because we walk at sunset fall through spring, and sometimes we eat first and sometimes after. Once a week, the 11 year old grandson spends the night. We go to our favorite food truck and get GF hamburgers and french fries, set the table and eat together. The rest of the time I eat as if it's interrupting my day, standing up, in front of the TV, at kitchen counter doing FB, at office thumbing through new mail. Storytelling friends began an initiative to bring families together for meals and sharing stories, to help build community, and it was popular and successful.